Looking for Frozen Meals? Click Here! Meals on Wheels takes the worry out of cooking and eating well. This program supports you with good nutrition, independence, personal contact, client follow up, convenience, community and peace of mind – affordable meals delivered to your door! Meals can be ordered to meet special dietary needs, textures, allergies and personal preferences. Choose between hot meals, frozen meals or a combination. Just call to have your meals started. Meal menus are planned according to Canada’s Food Guide to Healthy Eating. · Cardiac: for clients with congestive heart failure, this diet is restricted in both sodium and fat. · Gluten-Free: for clients with Celiac disease. · Lactose-Free: for clients who restrict milk and milk products in their diets. · Gastric: for clients with stomach problems such as ulcers or hiatal hernia. · No Added Salt: for moderate sodium restriction. Intended for those with high blood pressure or renal disease. The “No Added Salt” diet allows some salt in preparation of foods, but excludes very salty foods. · Modified Texture: This is a modification of consistency for people who have difficulty chewing or swallowing regular whole foods. Includes minced and pureed diets. · Diabetic: A diet designed for clients placed by their physician on a diabetic diet. Office/Scheduling Hours – Monday to Friday from 8:30am to 4:30pm. Service days and times vary by region. This service is available throughout Huron and Perth County. Traditional Pot Roast, Chicken a la King, Apple Braised Pork or Salmon in Lemon Sauce. 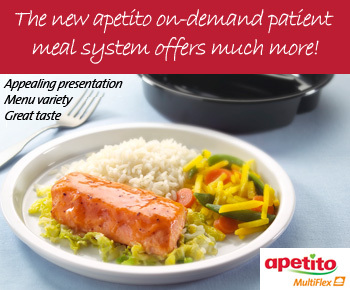 These are only a few of the tempting apetito Frozen Meals available from ONE CARE. With apetito frozen meals you can choose your own menu and prepare these entrees, soups and desserts at your own convenience. The frozen meals that are nutritionally balanced and designed particularly for seniors. Getting the right nutrition daily has a important impact on one’s health and independence. That’s why apetito frozen meals generally have more protein and vitamins with controlled levels of sodium and less fat than other commonly available prepared frozen meals. Click here to see the new Apetito menu. Click here to see the apetito nutrition guide. Flexibility to choose the menu. More variety at meal times. Safe food, no worries of outdated food. A fully prepared meal with more protein and vitamins, controlled levels of sodium and less fat at a reasonable price. Overall better nutrition as all meals have been based on recommended government nutrient levels for seniors. On average a meal consisting of soup, entree and dessert provides 40% of daily calorie requirement and 50% daily protein requirement. Convenient preparation – entrees can be heated in the microwave or oven, soups heated in a pot on the stove or a bowl in the microwave and desserts simply require defrosting. Entrees are packaged in recyclable paperboard trays. Soups are packaged in recyclable plastic containers. Desserts are packaged individually in recyclable plastic containers. Click here to view apetito’s menu. Frozen food can be delivered directly to your door over the noon hour. Deliveries are made every second week. Meals may also be picked up at our Stratford office located at 643 West Gore St. (Spruce Lodge Complex) or in Clinton at the Betty Cardno Centre at 317 Huron Street. You may call your order in advance if you wish.